The leap to extraordinary is elusive. It’s beyond a careful juxtaposition of luxury ingredients with profane techniques. Or profane ingredients and luxurious stylings. It’s beyond turning the crank of success from yesterday’s inventive moment. Rather it’s a study in delight. That which is remarkable surprises us. It’s a union of the convergent and the divergent. It catches our attention in one move of the pendulum, then disappears in the next. Astrophysicists refer to this dynamic as a Third Gravitating Body. Roy calls it the secret to enduring attraction. Today let’s admire eggs acting in this capacity. Most of us consider eggs as breakfast fodder. That which pairs with biscuits and pork products. Fried, poached, or scrambled, it’s still the stuff of the morning meal. Eggs are clean protein of Rocky Balboa. That muscle-building drink which super charges the day. In the hands of an artist, it’s the Magic White oil paint. A catalyst ingredient that softens and enriches. It foils the bitter and the brittle. It pillows on the tongue. It oozes as an easy sauce for crunchy bread or silky pasta. As diners toss a stony salad of peppery greens and toasted bread, the sunny side-up egg releases a golden elixir. It merges with walnut oil and champagne vinegar to form a blessing of a dressing. The egg white torn under the weight of the fork forms a contrast of it own. It’s white gleams like newly fallen snow among the pine. The texture reminiscent of semi-soft cheese. Paul Qui takes apart expectations of duck with blackberry and dandelion with a bit of scrambled. It dampens the gamy, the tart and the bite. Paired with crab cakes, sourdough from San Francisco and hollandaise, poached egg becomes the ultimate in Eggs Benedict. It’s both substance and sauce. In the mind of Chris Weber from the Herb Farm, the yolk is a hidden treasure to be buried the heart of ravioli. For the people of Kuala Lampur, eggs cool the temperament of other dishes. Vinegar and time transform egg whites to an amber jelly. The yolks turn to charcoal sulfur bombs. With thinly sliced ginger, these Century Eggs provide relief from crispy shrimp-cake. Even cocktails find new life with eggs. Traditional eggnog might frighten cardiologists since it teams with yolks, cream, whole milk and brandy. However it’s a holiday treat that lifts smiles. In Minneapolis, mixologist Pip Hanson turns a trick with his cocktail, the Oliveto. 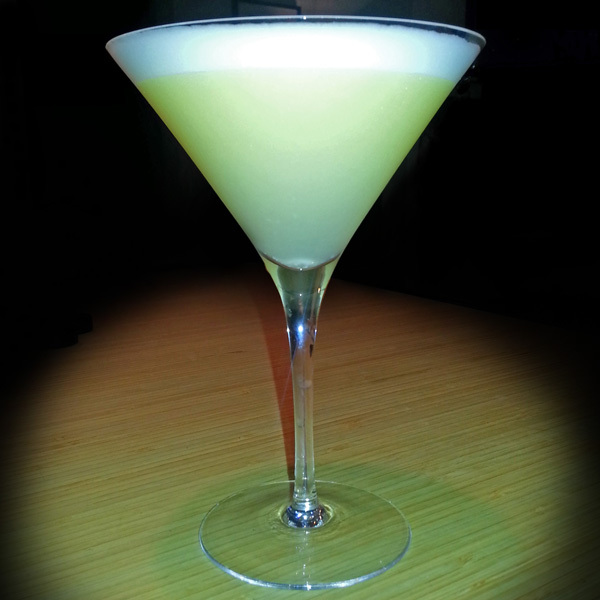 He leverages egg white to emulsify olive oil and gin with lemon juice. Some call it a liquid lemon meringue pie since white foam floats on top of a tart sweet body. Oddly enough, slickiness of oil and the heat of booze give way to a creaminess. Vanilla citrus from the liqueur and the herbaceous notes from gin nest well together. More than the sum of ingredients. So if you find yourself looking for that added edge, crack an egg. It’s what defined Grandma’s pizza. A pie inspired after the marathon of the same name. Onions, peppers, mushrooms, and spinach blanketed by smoked gouda, mozzarella, spiced by nutmeg and adorned with an egg.